Remember Mollie Bell Clements Lee? She and her husband, Bill Lee, ordered their home from the Sears Catalog about 1917 (see Ray City’s Mail Order House). Mollie Bell Clements and William David “Bill” Lee were married on Wednesday, February 22, 1905. Presented here, the wedding announcement that appeared in The Valdosta Times. The bride was a daughter of Martha J. Baskin and David Clements. The groom was a son of Moses C. Lee and Amanda Clements. 1905 Wedding announcement of Mollie Bell Clements, of Ray City, and William David Lee, of Milltown. The announcement appeared in the Saturday, February 25, 1905 edition of The Valdosta Times. A Wedding Near Ray’s Mill. 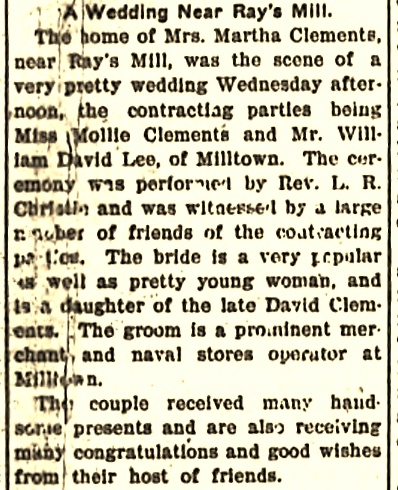 The home of Mrs. Martha Clements, near Ray’s Mill, was the scene of a very pretty wedding Wednesday afternoon, the contracting parties being Miss Mollie Clements and Mr. William David Lee, of Milltown. The ceremony was performed by Rev. L. R. Christie and was witnessed by a large number of friends of the contracting parties. The bride is a very popular as well as pretty young woman, and is a daughter of the late David Clements. The groom is a prominent merchant and naval stores operator at Milltown. The couple received many handsome presents and are receiving many congratulations and good wishes from their host of friends. In the early 1900s rural consumers found they could purchase almost anything from mail-order catalogs, including homes. About 1917, one Ray City couple did just that. The Avondale, Sears mail-order home ordered by Mollie and Bill Lee, of Ray City, GA in 1917. 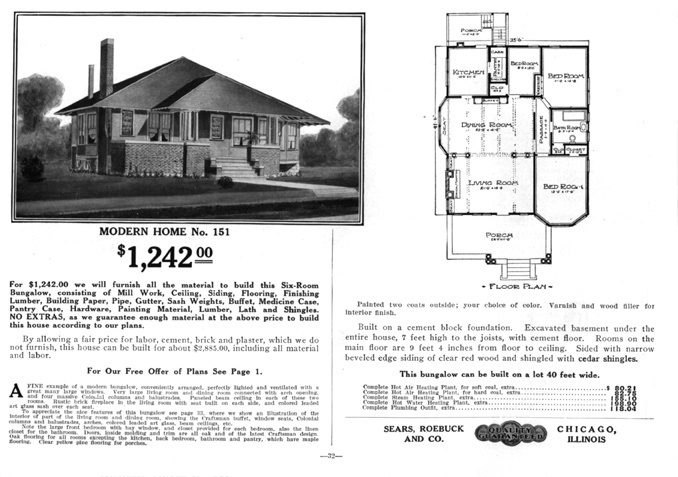 Sears Catalog Homes (sold as Sears Modern Homes) were ready-to-assemble houses sold through mail order by Sears Roebuck and Company. Over 70,000 of these kit homes were sold in North America between 1908 and 1940. Shipped via railroad boxcars, the kit included all the materials needed to build a house. Many were assembled by do-it-yourself homeowners with the help of friends, relatives, and neighbors, in a fashion similar to the traditional barn-raisings of farming families. As an add-on, Sears offered the latest technology available to house buyers in the early part of the twentieth century. Central heating, indoor plumbing, and electricity were all new developments in-house design that “Modern Homes” incorporated, although not all the houses were designed with these conveniences. Central heating, for example, not only improved the livability of houses with little insulation but also improved fire safety, a worry in an era when open flames threatened houses and even entire cities, as in the Great Chicago Fire (1871). As demand decreased, Sears expanded the product line to feature houses that varied in cost to meet the budgets of various buyers. Sears began offering financing plans in 1916. However, the company experienced steadily rising payment defaults throughout the Great Depression, resulting in increasing strain for the catalog house program. More than 370 designs of Sears Homes were offered during the program’s 32-year history. The mortgage portion of the program was discontinued in 1934 after Sears was forced to liquidate $11 million in defaulted debt. Sears closed their Modern Homes department in 1940. A few years later, all sales records were destroyed during a corporate house cleaning. The only way to find these houses today is literally one by one. One Sears mail-order home was purchased by Mollie and Bill Lee of Ray City, GA.
Mollie Bell Clements and William David “Bill” Lee both grew up near Ray City, GA. Mollie was a daughter of Martha J. Baskin and David C. Clements. Bill was a son of Moses C. Lee and Amanda Clements. He was educated at the Green Bay School near Ray City, where he was a member of the Advanced Literary Society. Mollie and Bill were married February 22, 1905 in Berrien County, Georgia. As newlyweds, they made their home in a two-room log cabin. 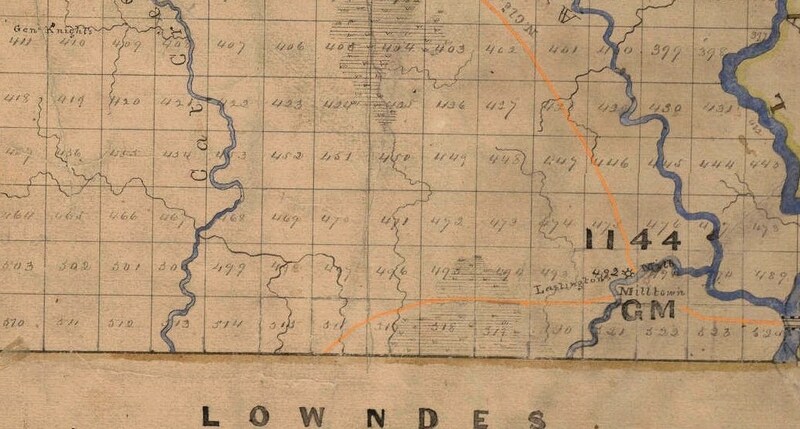 The Census of 1910 shows William and Mollie living in Georgia Militia District 1144, the Rays Mill District, with their two young children, Vivian Lee and Fannie Lee. Bill was farming on his own account. By 1917, the Lees had four more children, Ruth Amanda Lee, Willie E. Lee, Mary E. Lee, and Moses Clements Lee. Clearly, it was time for a bigger house. 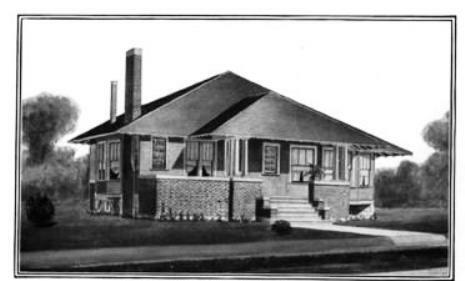 About 1917, Bill and Mollie ordered a “Modern Home,” The Avondale, No. 151, from the Sears Modern Homes Mail Order Catalog. The materials were probably shipped via the Georgia and Florida Railroad to Ray City, then carried by wagon to the construction site. The Lees purchased additional interior components to complete the house from the Sears & Roebuck store in Valdosta, Ga. The home would have been assembled completely by manual labor, as electric power was not yet available in Ray City in 1917. The house had seven rooms, and the common features of the time, like 12 foot ceilings, plaster walls, wood floors, and bay windows. Over the years the Lees modified the original floor plan of their Sears home, adding on to the back of the house to enlarge the kitchen and rear bedrooms, and adding a sun room off the master bedroom. Nearly 100 years later, the house still stands near Ray City. House plans for The Avondale, mail-order house sold by Sears, Roebuck & Co.